Easter is one of the major festivals for the Christians. It is the most auspicious occasion for the Christian community for they engage themselves in a number of religious as well as fun filled activities. Since Easter is celebrated in order to commemorate the resurrection of Lord Jesus, thus many related customs and traditions are duly observed. Although some of the traditions and customs vary according to different places as well as due to cultural differences, however the zeal and passion with which these rituals are observed remains equal to all. Thus continue reading and explore it for your how Easter is celebrated abiding every rituals. 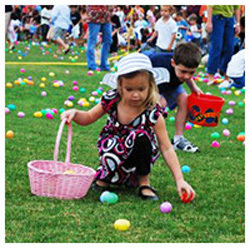 Egg hunt is considered to be a way good-old tradition related to the celebration of Easter. The tradition is followed in many countries of the world. As per the tradition, children are often endowed with the task of retrieving the beautifully decorated eggs, hidden at strategic locations such as backyard or at every nook and corners of their home. However with passing years, the tradition has attracted a large number of adults as well, and today it is a common sight where the adults are found accompanying their kids, on Easter egg hunts. However not only these Easter Egg Hunts are constricted within the boundaries of the house, local clubs and organisation do arrange for Easter related quizzes and contests. Decorating the Easter eggs can be as important as that of the egg hunt. 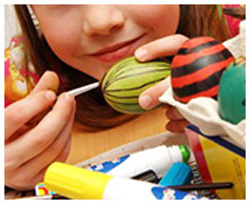 Decorating the eggs with vibrant colors has been a kind tradition observed since a long time. However over the years, with the changing trend, people have started embellishing their Easter eggs with synthetic colors and dyes. Simple as well as intricate patterns are duly painted made on the eggs. Thus not only the natural chicken eggs are decorated, some mouth-watering chocolate eggs are also beautifully decked for the purpose of Easter. Another oldest form of rituals associated with the celebration of Easter is by attending church services that are rendered. 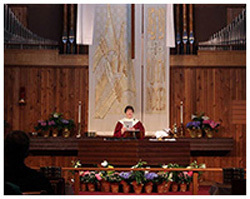 Since time immemorial, special prayers are held at various churches, wherein the congregation chants religious hymns thus praising the Lord for everything. The services provided vary in duration for it can be short or may as well last as long as six hours. Thus in order to attend the Easter services people in groups gathers in churches. This special Easter church service is usually held at the midnight between Holy Saturday and Easter Sunday thus it’s the time when the priest announces 'Christ is Risen!’ The congregation finally carries large white candles, in the remembrance of the Resurrection of the lord. Easter can be considered as a beautiful occasion when one relishes on the indigenous tastes of the countries, as the people insist on serving their respective native dishes native. 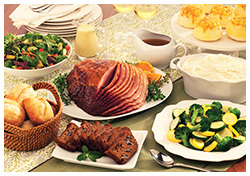 Thus if one gets to travel to different places, one is sure to see the differences in the tastes, flavor and aroma in the recipes prepared for Easter. Amidst the list of menu, Lamb, beef, chicken will definitely be served to the non-vegetarians, whereas their vegetarian counterparts prefer eating the veggies and fruits harvested in the spring season. A wide variety of cakes are also prepared which are exclusive to this festival.